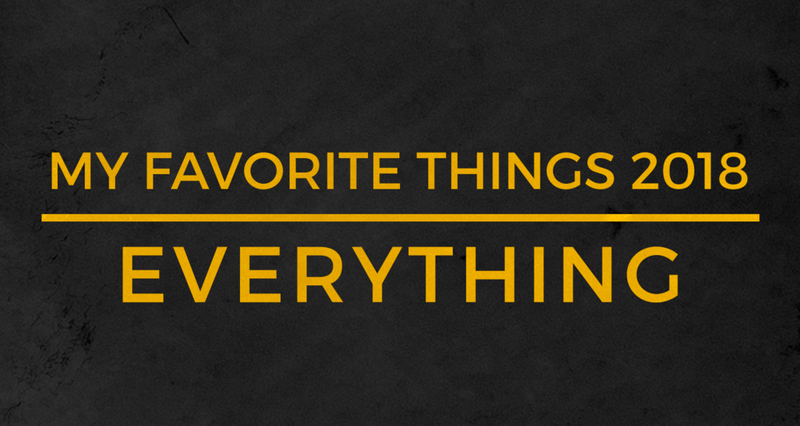 My lists are all short this year and I have a long holiday break to enjoy, so I’m going to combine this year’s My Favorite Things posts into one. I hope that’s cool. I gave fewer releases a lot more attention this year. These 18-count, plus the Beatles White Album reissue and the Sirius XM station make up my music listening habits for the year. I also started building bi-monthly playlists in July. You can check them out here. I joined the staff at Breaker in spring of this year. As a result, I was delivered a newsletter with my listening statistics for the year. Unfortunately, I marked every episode of every show I’d listened to up to that point as “listened,” so my results were pretty skewed. My weekly stats tell me that I listen to ~40-55 episodes a week. That’s roughly 46 hours worth of audio streaming through my brain Monday-Friday, double speed of course, with silences skimmed off as well. Given the nature of this semester’s long and frequent commutes, I actually had to pick up some more shows to fill the time. These are the shows I started in 2018. The Adventure Zone (Maximum Fun) - Completed the Balance arc and experimental runs. My Brother, My Brother and Me (Maximum Fun) - Goodness these brothers are funny. Build Your SaaS - The official Transitor.fm podcast. This is my host of choice. I got really into the true crime narrative genre this year, as you can tell. This form of journalism caught fire in 2014, but is really starting to hit its stride. The Teacher’s Pet actually brought on a new trial for a man accused of killing his wife in the 1980’s. I burn through these shows in very short periods. Despite the above list, I actually paired down my subscribed shows. I nixed all but one or two technology podcasts and muted interview shows that I only like to dip into occasionally. I’d like to make my subscriptions more fluid going forward. There was one audiobook included in the mix, which took up about 2 weeks-worth of podcast listening time. That book was The Dead Zone by Stephen King which was homework for my guest appearance on the Chat Sematary Podcast. Is it just me or did 2018 pale in comparison to 2017 as far as film is concerned? I still have some Oscar contenders to watch, but few of the 46 new films I watched have screamed “Best Picture” to me yet. I’ll gladly accept recommendations. For now, these are my personal favorites. For more of my film stats for the year, you can check out this page on my Letterboxd profile. Netflix had a good number of limited series this year, some of which were counted in my Letterboxd stats, but are repeated here. Patriot (Amazon Prime Video) ✮✮✮✮✮ - Damnit, this show is really good! My favorite episode of TV this year was Atlanta’s Teddy Perkins. I spent some time with the Monty Python boys via Flying Circus and Fawlty Towers. I now understand the love for Parks and Recreation. I didn’t purchase any new video games this year, but Mae and I also dropped back into Alien: Isolation, which I initially quit about 10 minutes into gameplay because I couldn’t find a silly hatch in the floor to continue. We found it this time and pushed through for another 2 hours. Mike Comite and have started streaming some old LucasArts games on Twitch, starting with The Dig (1995). I also played some D&D and board games with friends over Discord using Roll20 and Tabletop Simulator. A new podcasting publisher has popped up called Engle and their first show is a hit. The Undersiders is a series about the intersections between the burgeoning hip-hop movement and the sale of drugs at mass. The show is produced in binaural sound and really well crafted. Being that Engle is a french company, the show has been produced in both French and English languages. It’s the 80’s... Hip-hop is beginning to emerge. Cocaine is already everywhere and crack is about to make a dramatic appearance into ghetto life. This unprecedented consumption will make some dealers into the new kings of the streets, and also new role models for their community. The Undersiders will tell you the story of eight of them. True and crude. Tales about millionaire drug dealers who at one point directly impacted on the development of hip-hop. Dr Dre, Tupac, Lil Wayne and many more… would these pop culture icons have had the same career without these figures? Without being judgmental, without glorification, the Undersiders will guide you down into hip-hop’s turbulent underground and follow its rising up as a worldwide culture. The first few episodes are already up and I listened through at a steady clip last evening. Episodes are less than 30 minutes and packed with information and well-written story-telling. I highly recommend it to any fans of hip-hop and its origins. Episode 205 of The Modern Vinyl Podcast takes on The Weeknd’s new release (NOT EP), “My Dear Melancholy,.” Chris and Mike, along with special guest Jacob Tender (Bantha Fodder), discuss where the EP belongs in the Abel Tesfaye story, along with misogynistic trends in his writing. Lovely chats with the MV guys about the new album from The Weeknd. Back again for a look at the Solo teaser trailers. In the twenty-seventh episode of Bantha Fodder, Mike and Jacob take a "quick" look at the Han Solo teasers aired during the Super Bowl. In 2013 A friend introduced me to Old Best Friends’s ‘Keep In Touch,’ an EP that changed my world. Over the next year Mike Comite and I became friends. In 2015, we started a podcast called Bantha Fodder. We’ve recorded 26 episodes including two holiday specials. This year I wrote a self-reflective parody of “Things That Happen,” one of my favorites from that ‘Keep In Touch’ EP and Mike actually recorded it.